Cinema Calling is an ultimate hands-on acting and filmmaking experience and is an advanced level of filmmaking for the truly discerning cinema enthusiast. Filmmaking is taken out of the classrooms to outdoor locations where participants are given a hands-on experience of working on a real film. We choose the world’s most energizing places and exciting events as our work areas, and share our passion for filmmaking with students of all ages and levels.Sessions are combined with fun activities like mid-night screenings, photography assignments, behind-the-scenes making and much more. The chosen shooting location for Cinema Calling is Corbett. Participants will be living, working and shooting in the wilderness with many outdoor enterprises planned. A filmmaking programme designed especially to give an insight into the art of filmmaking, mixing the highly intensive curriculum of film schools with the madcap fun of a workshop with an outdoor location. Participants are provided with an in-depth knowledge of filmmaking, preparing them as the next generation of filmmakers to backpack as a real professional crew. Professionals from the film and television industry will train participants in the different spheres of filmmaking during the course of the workshop. Participants will be provided with camera, lights, editing machines and other necessary film equipment to familiarize them with their functions and usage. Cinema Calling allows participants to choose their area of focus, while learning the overall process of making a film. Beyond writing and direction, some participants may enjoy acting, while others may prefer the technical side of production. The programme is composed to extract the best out of a person’s natural talent and fit it to complete the jigsaw that is a film. They will thus form a crew that will make a whole film which will be entered in film festivals around the world. It is our mission to give personalized and comprehensive training to help students develop their filmmaking skills, whether for a new hobby or to jumpstart a career in films. Plese send us a mail on mark5films@gmail.com detailing your intrest area. My name is chandergupt shorya. I am interested in acting and model. I AM A STUDENT OF JOURNALISM. FURTHER I WANT BE A FILM MAKER. i want to take part in workshop.please tell me details. can you help me through the process and also can you tell me about the regarding workshops..??? I came across this website and i can relate to the things mentioned over here..and i think its quite cool :)..i love films and the ART of making them. i dont not have any formal training in filmmaking but i can hope to learn a lot from you guys . How can i be a part of your group ? Ya sure, If Cinema is your passion then we are looking for you. Please get in touch with us. call us on +91-9971988936. personally i am a writer and a thinker but i want to learn more about direction and cinematography. are there programs for working people ? Hey! We understand the Cinema or Filmmaking requires a lot of time and persistence. We would suggest you to join our filmmaking programme to get information about filmmaking process. It will help you in exploring your capabilities in the respective fields. There are various departments in filmmaking to choose from. You will learn Direction. Acting, camera, script writing and make your own films. CINEMA CALLING is the best outdoor filmmaking course to test your self in this field. Please mail us at mark5films@gmail.com or explore the site to know more. Quick into: its a highly designed filmmaking programme. its for 2-3 months and you would making a film @ jim corbett. Please send your name, age, email id, phone number and you area of interest OR press ask for info on the website. I WANT TO DO ACTING COURSE FOR ON MONTH, PSE INTIMATE FEE AND TIME . hi..sir iam shadab khan.i want join yours course.b coz i am verry interrested in acting.so sir i want some information about it. Hey! 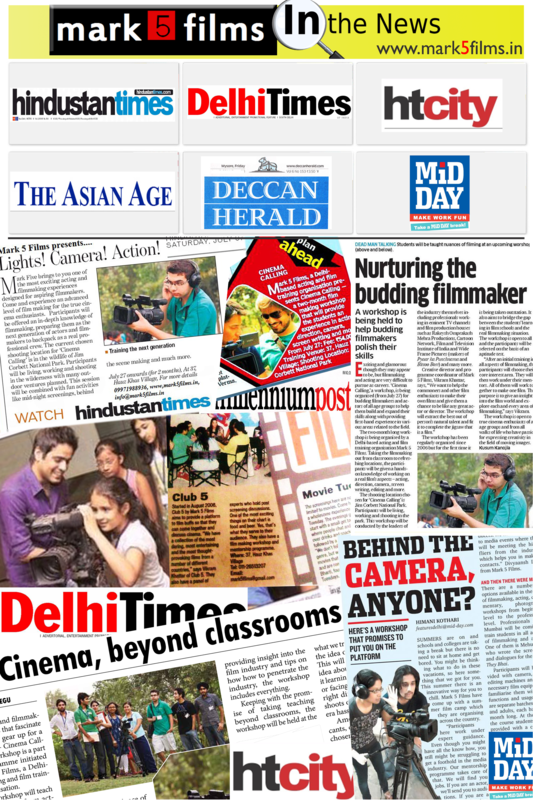 Shadab, thanks for showing interest in our filmmaking course. Please send your details on 09971988936, NAME, AGE, EMAIL and your Area of Interest. I want to get training in Cinematography… Can i apply for that..?. If yes, Then How can i apply for it? Dear Simran, Please call us on 09971988936. There are special as well comprehensive courses relate to cinematography course. P.S: Explore the whole website to know more. hey sir.., i want to join your course bcoz i love to act and acting is my passion.